Pleasant good morning to you :). As I write to you today, with a heartfelt expression of gratitude for having given me the opportunity endorsed under the Jus Sail Youth Training Program to be where I am today. To realize my full potential and to be just about anything that I want to be. 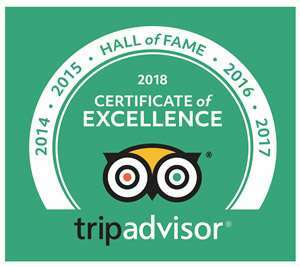 I must admit when I first started the program I was filled with excitement, It was summer and I figured it would be the perfect fun-filled, laid back getaway. Nonetheless, to my surprise there were things I had to do in order to enjoy that “fun-filled, laid back summer experience I’d imagine. As we went into the first two weeks of the program, I became weary and wanted to give up… because it was not what I had imagined. 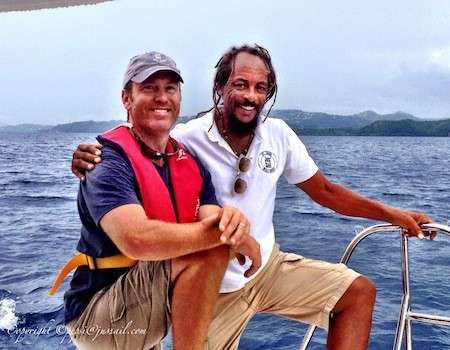 From learning how to tie knots, to learning the parts of a sail, of a boat to being out on the water sailing to and fro the pristine waters of Rodney – Marigot, for me it completely took the fun on a whole new level, something I didn’t want to be a part of anymore. I became frustrated, I wanted to give up… I wanted to be done. But I’m glad I endured throughout the program for I would have missed out on all of the opportunities, on all of the guest speakers who took their time out to speak to us, to relate to us know of how fortunate we are, to lay down guidelines to succession, to being where we want to be, to reaching out full potential. I am more than grateful. Many thanks to them all. To you Mr James and Mrs. Pepsi a complete role model to me. For you who have inspired me to be that girl who doesn’t shy away or to use fragility to prevent myself from participating in courses outlined in the program… I must say it took a while to adjust but I did it!! For being there to support not only me but my fellow colleagues this is worth being merited. Not only would I like to thank you for being there for us, for ensuing we had provisions and that the best would be yet to come, I would also like to thank you for believing in me. Thank you for instilling in us a spirit of gratitude with positive attitude, of self-awareness, of respect and bringing out so many of these intangible nurturing aspects within us. You have done an exceptional job. Not forgetting Nick a support to us all, assistance and also ensuring that even during the darkest times we are surely going to see the light. My greatest thanks to O’Brain for never giving up on me… For being there to guide me through the program and ensuring that everything will be okay. 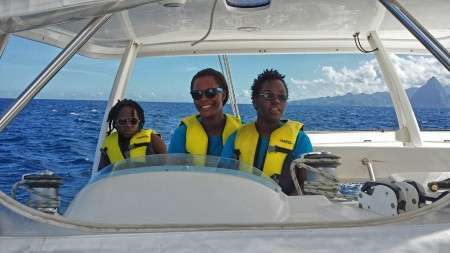 Not forgetting thanks to our sponsors who’ve made it possible for us SLHTA, KFC and the rest; for making it possible through the program to experience the journey to the Grenadines which by far will be an unforgettable memory to us all. A heartfelt thanks also for the outcome of this program… In the end, I was able to tie all 8 of my knots ( yay me!! I did it) and also for the interviews which were set up to attend. 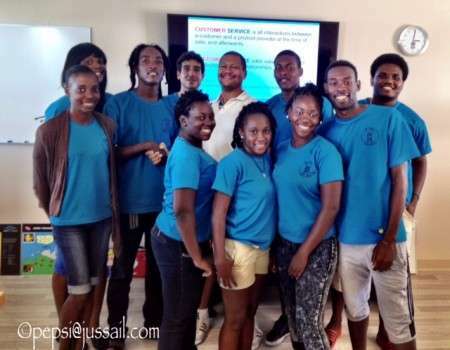 As today marks the end of the internship which was a wonderful experience, I’ve decided to stay with Captain Mikes/ Saltwater Services to be an ambassador of the Jus Sail Youth Training Program 2015 to put to use all of these intangible aspects brought out during the program. They’ve all been playing a major role thus far: from being a conscious and connected consumer, to being able to use the communications skills with professionalism and so much more. I am honored to having completed this journey. I look forward to the graduation in October where we all can meet once more and reminisce on what I would say have been one of the best summer for me and if I may speak for the others. 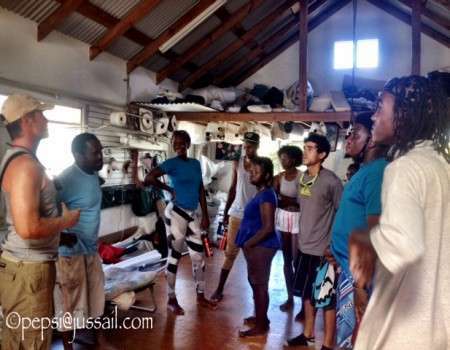 This year we had 10 students (5 young men and 5 young ladies) on the programme coming from the north and south of the island. 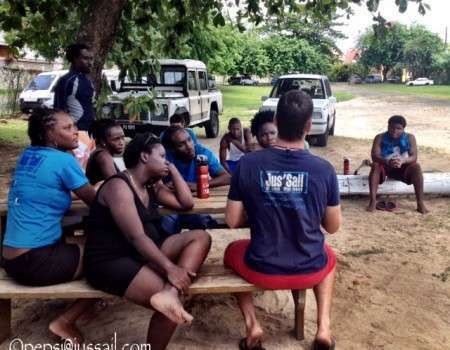 With the Support of The Saint Lucia Hotel Tourism Association and donations from guests, sales of t-shirts support from local businesses, specialist volunteers from the world of customer service, wellness, self help, communication, counselling & psychology we were able to put together a jam packed programme. Our aim for the programme is to give training, gain certification, and secure employment. 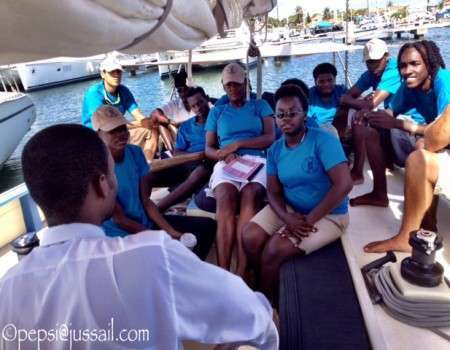 A vital component of the programme is empowerment and the best way we know to bring a team together and to learn a skill for life is through sailing. 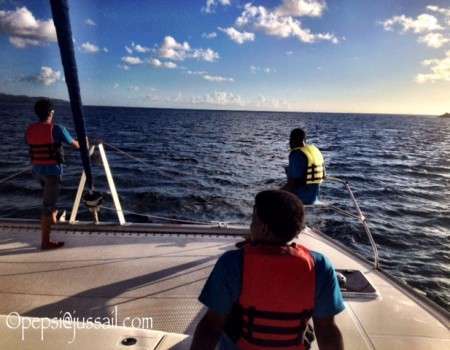 None of the students had sailed before so each student was out of their comfort zone. 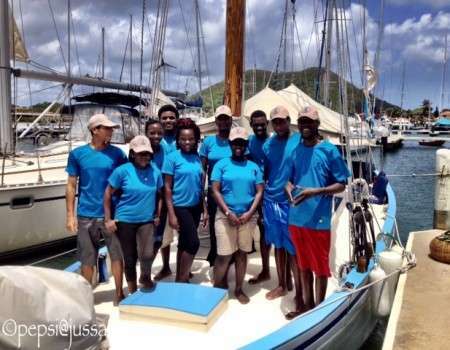 Yet by the end of the programme the graduating students received the following certification – International Yacht Training (IYT) Worldwide International Crew, First Aid and CPR and Swim to Survive from the St Lucia Life Saving Association. We are happy to report that all of this years students have had an opportunity to do intern work with various companies and already most have been offered full time work with others close to securing those contracts too! 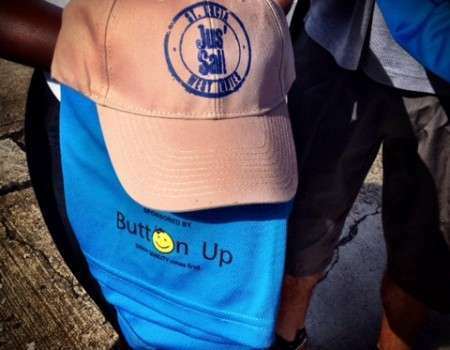 Button Up are a local Saint Lucian merchandising company that provides the students with their uniform. Owners Lymwell and Julianne have been great supporters of the programme from its inception. Before we start each day on the programme we always take a moment to share a quote or words of inspiration which will inspire and keep us focused for the day. Here’s James chatting to the students before the students get out on the water. 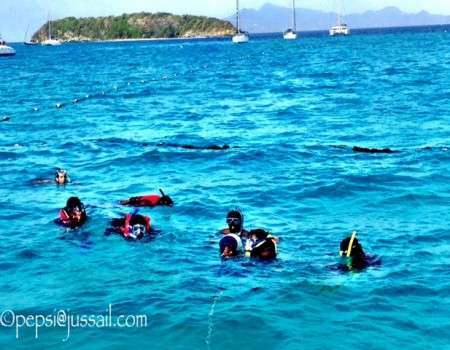 One of the highlights of the programme is the sail to the Grenadines, where we visit the stunning Tobago Cays and the tranquil island of Bequia, which with its rich sailing culture and the Old Hegg Turtle Sanctuary is a must visit. 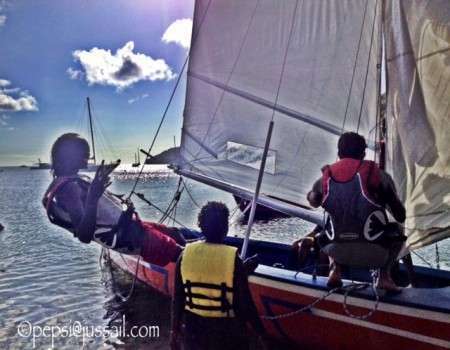 This year the students got to sail an authentic Bequia Double Ender. These traditional whaling boats are unique because the stern is shaped like the bow in case a harpooned whale pulls them backwards. Thankfully they aren’t used for whaling anymore just for racing! The students LOVED the exhileration of these fabulous vessels. Wendel George came along to chat to the students he shared his inspiring story of growing up on the island and difficulties he faced as a young boy, following the wrong group of friend to getting an opportunity which change his life for the ever. He now works for the SLHTA Tourism Enhancement fund as the Apprenticeship Co-ordinator. His message to the students was to stay focused, have a clear goal and work hard. Damon O’Donnell has been a volunteer on the programme from day one! He gives fun, informative workshops. Years of working for British Airways has given Damon an edge on the excellence and the importance of Customer Service. Here’s Captain James with Nick Oldlum, Nick is another pioneering volunteer having been a real benefit to the programme for the past 3 years. He inspires the students to enjoy and learn as much as they can, practice the skills they learn on the programme and have fun on the water. 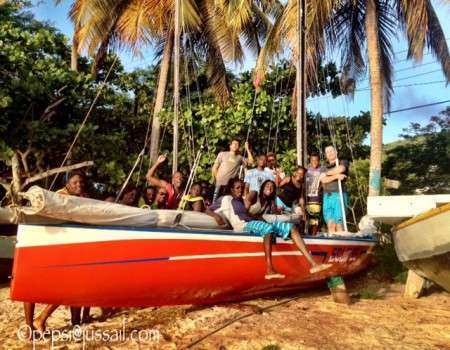 He believes he is living a dream when he is out on the water coaching the students. 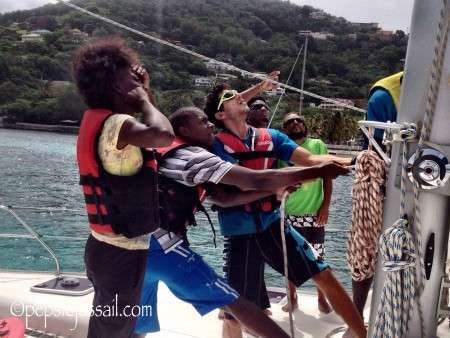 Its hard work pulling up the sails, it takes team work to get it right! All students take turns at preparing meals. Breakfast, lunch and dinner. 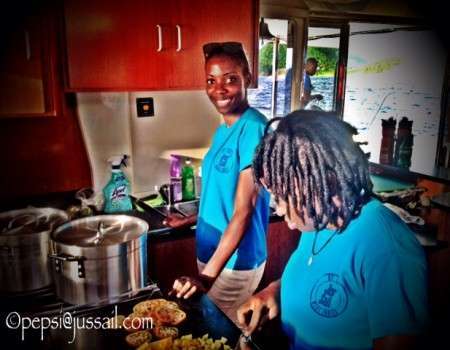 Here’s McGlensha and Lenia preparing the evening meal … These ladies consistently delivered excellence in the galley! We all ate like kings and queens…. 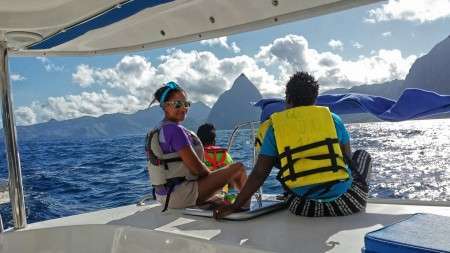 It was time to head home … with the Piton’s in the foreground we all watched our island grow in front of us, how beautiful it looked how grateful we all felt to be home … Saint Lucia we love!